And so Classroom Eye Candy was born. Classroom Eye Candy will be a feature where I invite you to join me in ogling creative classroom design in any form. We will learn about the teacher behind the classroom and the process he or she used to put it all together. I have no idea when the next one will be or how often I will post these features. All I know for sure is the criteria: I’ll know I’ve found the next classroom when I start writing in all caps. Q: What inspired you to arrange your classroom this way? A: After my stay-at-home-mom years, as I explored the options of becoming a teacher or a school psychologist, I became an overly qualified paraprofessional for a few years at a school. While there, I noticed a need for teachers who were comfortable teaching all kinds of students. I also noticed that when a student had an accommodation for special seating, or some other really cool environmental thing prescribed by the OT or SLP (etc), they would stick out like a sore thumb. I mean, having a bean bag in your lap to help you feel grounded is awesome, but not if you’re the only one with a bean bag. A chair on wheels that spins? Cool, but not if you’re the only one. You get the idea. So, believing wholeheartedly that people gravitate towards what they need without even having to really think about it, I started noticing (in meetings, at my home, out in public) that most people, if given a choice, choose their spots based on some known or unknown instinct. I vowed that my future classroom would be a place where those types of sensory needs were normal choices for anyone. I did get rid of my exercise balls, because they just never held their air … I have a dream for a balloon chair or an inflatable office chair or two (dar Living Balloon Seat), but haven’t acquired any yet. Students can choose from end tables, clipboards, hard place mats, long conference tables, circular tables, rectangular tables, single tables near the teacher’s desk, coffee tables, or the floor. These are kept on my shelves for students to pick up and hold/play with: stress balls, tennis balls, plush animals, noiseless things, hard balls, plastic Slinkies. No fluorescents—ever. I had a student with autism that could hear them and they would irritate him, which made me notice that I sometimes could get agitated when they are on too long, too. I have natural light in my classroom and a number of different light sources so they can always see well, no matter the time of year or day. Last year I had a student whose mom asked me to place a S.A.D. light in my room for her child, because she figured it would be the best place for the child to get a daily dose (30 min/day) and s/he fit right in when s/he sat in front of it in our classroom. I play music every day when they come in for class; the genre changes, to accommodate all the different interests in the room. I think that adds to the environment as well. Q: Where did you get the materials/furniture? A: Mostly I find these things at garage sales; I buy them with my own money. I DO work at a school with a basement full of furniture odds and ends that no one wants; if I ask for a piece down there, I get to use it until someone else wants or needs it for something (that is where the cool street lamp comes from: an old prop for some play or dance some years ago). Now that people notice my classroom, I get offers for cool things to add to our classroom, and I take them. Q: What’s the deal with that rainbow wall in the back? If you’re interested in hearing how I actually execute this efficiently for 150+ students after checking out that page, let me know. I’d LOVE it if people tried this with more high school settings; it makes a huge difference in the classroom. I also have papered walls on which kids can and do write questions or good news (they sign and date these entries). Those are near the rainbow wall in the back. Q: So how does it work? Do students choose where they want to sit all the time? Is there competition for the “best” seats? A: I knew I didn’t want to tie it to rewards, but I was afraid everyone would rush to all the sweet spots if I didn’t assign it or have some kind of a procedure for it when I first started teaching, so I used to assign it randomly. I found it wasn’t really necessary, and it didn’t fit with my philosophy for making the environment in the first place. I mean, what if a kid NEEDED an accommodation in seating/lighting, and they always happened to get the couch, or whatever? I also found some people becoming proprietary, even when only assigned a spot every once in awhile, because it became the ever-elusive spot? I’m not sure. So I changed it up. After that time, it becomes natural for them to pick a handful of different places throughout the room. Every once in awhile, I go through this again if I notice that they are gravitating toward the same spots over and over again. I tell the kids I’m trying to get them to relax enough to learn and to figure out what works best for them; I remind them that what works one day may not work the next day. Also, if a student chooses a place where s/he is not oriented to the front naturally, it is likely her/his chair is one which has been carefully placed so s/he can spin towards a speaker at any time, and I teach this as expected behavior at the beginning of the term. People always assume that kids will fall asleep in such a relaxed environment. That’s just not the case. Students tell me that the room is not only relaxing, but also makes them feel cared about and understood. Q: Have you noticed a difference in how your classroom feels and operates compared to earlier arrangements? A: No…because I never was a rows and desks person. Maybe that’s not true…I didn’t get the tables until the middle of my first year, so I had desks. Most of the kids hated the desks because they didn’t fit well and felt constrained. No one ever chose them first, that’s for sure. I slowly phased them out. This year, I have no conventional desks at all and I’ve never been asked for them. Students tend to ask their parents to come visit during high school open houses (this is usually not a hot event for high school age students); I think that says a lot. I’d like to thank Rebecca for sharing her space with me. I hope it inspires others to find ways to offer students choices for getting comfortable in the classroom. If you know of a classroom that deserves to be featured in Classroom Eye Candy, contact me here. It looks very Montessori! I love when classrooms are organized but gentle and soothing to the eye. I would LOVE to see a creative science classroom. I don’t have a lab section — the students sit at the tables where they do labs. And I have carpeting! So I would like to see some ideas of what I could do with lab tables. I have tried to provide at least some of these options in my classroom. I am not allowed to bring in any upholstered furniture, but I have found that I can provide students with more choices by having desks instead of tables. I have several different styles of desks in my classroom, arranged in different configurations and orientations so that students can work in a more personalized setting – while still being able to push their desks together for labs. I also sewed a “window seat” by layering felt/vinyl table cloths (like for picnic tables, which I was allowed to bring in) so students can sit comfortably on my wide window sill. Since I have several lab materials stations around my room as well, I use those as opportunities to bring in alternative lighting, clipboards, fidget toys, etc. While I love the look of this place, I’d issue a caution… A former colleague had to remove a recliner from his classroom because it failed to meet OSHA requirements for flame resistance. I’d worry that anything upholstered would also potentially cause this same problem. Perhaps teachers would want to contact the appropriate people in their buildings/districts before considering bringing any upholstered furniture into their classrooms. That’s good advice, Jody. Thanks! Just a comment about the flame resistant caution…that IS true. My custodian is a darling and he actually came to me and told me that when I changed my classroom over to flexible seating and brought in our old living room modular sofas into my classroom. He sprayed them all with a flame retardant substance which did the trick as the Fire Marshall was content with that. And most newer furniture already has that flame resistant element added to the cloth. SO COOL! I know my students would benefit from a space like this! I would like to know how it works when the teacher is doing a directed teaching lesson or mini-lesson. We have a hand signal for whenever someone needs attention; when the signal is given, all attention goes first to me, the teacher, then I direct the students (with my eyes) where their attention should be placed. So….whenever I need to deliver instruction, I use the hand signal and everyone orients their bodies towards me. It works out just fine. Rebecca– just curious, what is the signal you use? Do you assess in this arrangement? I could simply take my learners to the Media center for assessments. Hi, Vonia! I’m a Customer Experience Manager with Cult of Pedagogy. You may want to read through all the comments — Rebecca replied to several other readers who were also curious about testing. You may get more ideas there. Thanks! What a small world! I know this teacher personally. She and I took some creative writing classes together when I was in college. She is such an inspiring, kind, encouraging person. Her students are lucky to have her! No way!! That’s pretty cool, Shelby! I love, love, love this classroom. I wish I had been in a classroom like this when I was in school. Our HS school has two new class sets of Chromebooks and this would be a great way to have a classroom set up so they could work comfortably on assignments. I plan on sharing this with all of my PK-12 teachers and staff. I would love to transform our HS Library into a space like this…many great ideas I may borrow from this article. Our new HS counselor has changed her office around to incorporate lamps and a comfortable couch…just had to share this article with her a few moments ago. That is great! I hope you show us pictures of your library when you transform it and tell us how incorporating some of this philosophy works in your educational setting/s! I teach 5th grade, and Rebecca nailed my thoughts/ideas/plans for my classroom perfectly!! I’m about halfway down the path toward a classroom like this, and now I’m absolutely itching to keep going! Thank you for sharing this. I can’t wait to see more pictures and get more ideas from additional teachers out there! Thanks, Heidi! I hope you share your experiences (and maybe pictures?!) with us! My largest class is now 30. I could accommodate more, if needed (there is enough seating). I do not know the square footage, but I know the panoramic shots make it look bigger than it really is. I think the windows make the space look bigger too. Oh my stars! That is gorgeous! I’m totally stealing your chalkboard paint idea….I feel a new kind of coffee table coming my students’ way! That’s awesome! I was actually just about to ask about flexible elementary rooms. How can I establish this classroom style as a brand-new teacher? Janet, I would also like to know how to accomplish this as a first year teacher! I’m graduating in 6 days and am hoping to land a 6th grade middle school position. The classroom right now is WALL TO WALL desk. I hate it. I’m afraid 35 kids to a classroom would be difficult, but I am determined to have a classroom with a similar atmosphere! This would be really comfortable and colorful; but, alas, I see about 5 different fire codes being broken in our state. So unless I wanted to spend a great deal of money on approved merchandise it won’t work for us. I may modify the rainbow wall for assignment purposes. Thanks for a great idea. Hi Michelle ~ Would you mind pointing out what these are? Safety is obviously important to all teachers, and I’m sure those who are enthusiastic about setting up their classrooms this way wouldn’t want to waste time doing things they’d have to undo. 2) I have wheel chair students – how do you manage that? I don’t currently have a student in a wheel chair, but I’ve had lots of other students with special needs that do well. Right now, I do have a student who is visually impaired; she tends to stick to one side of the room more than the other; she says that is her preference. Our fire department does at least one walk-through every year. We are not allowed to use any upholstered furniture in our rooms due to their restrictions. We’ve been told we can have the furniture items that are used in hotel lobbies that is covered in fire-retardant fabric (I suppose you can purchase this second hand). Just food for thought before you go out to your local thrift store. Unfortunately, we also have very strict fire code laws in my state that would restrict a classroom like this. Our School district also frowns on using throw rugs and in some schools, they are banned altogether. Nothing hanging from the ceiling (fire code). No upholstered furnishings (fire code/ school district (allergies). No used furnishings (school district(allergies). Though I have no fluffy furnishings, I do have three “left on the roadside” bookshelves in my room! I love this concept – everything about it would be perfect for the way I teach. You’re so lucky – I wish teachers in the UK would be allowed to do stuff like this!! Anyone know of any UK schools where the teachers are allowed to change their classrooms like this? WOW! I definitely just emailed this link to my admin team and my teaching partner. In our class we have right now what I would call and “eye candy corner”, but we are very far from an entire classroom. Beautiful, accommodating to learning styles, soothing, peaceful, and best of all NO (horrendous) FLUORESCENT LIGHTS! I am incredibly inspired. Love this new section of your blog, Jenn! I love the idea of the affirmation wall. After checking out the links above, I would like to know more about how she manages the affirmation wall. How do you make sure all students receive affirmations? How often do you “assign” them at first? What do you give them as guidelines in the beginning? Great post! I would love to share this better; it’s powerful inside out. I have tried and failed and then found successes to share on how to make it efficient and beneficial for all. I’ll write those out and figure a way to share. I, too, would like to know how you manage the affirmations. I love the idea! Add me to the list as far as wanting to know more about managing the affirmations. Seems like a really great idea, just wondering how the practical aspects are handled–how to avoid kids being left out, how often they’re posted and what you do to screen them, etc. I, too, would love to be added to a share string on the affirmation wall. I’m so inspired by everyone’s comments, suggestions, and, alas, unfortunate reality checks on fire codes. I have regular run-ins with the fire marshall annually about the very little I have done to my classroom to make it a warm and inviting place to learn. I have fire retardant material over ever hanging, dangling, floating item in my room. Including every plastic flower that lines the inside of the alcove to my room. Painstakingly tedious work, let me warn you. But, the effect it has on a student who walks over the threshold of our shared space, feels special. I’d like any advice on how to warm up a room with things that won’t set the fire marshall on fire, so to speak: standing tables, the hotel furniture (someone mentioned), etc. Any of those tips, or photos of classes that have thwarted this foe. Thank you, all, for being the creative and thoughtful teachers I’m sure you are. I too would love to know more about your management of the affirmation station. Sounds like wonderful way to create a positive learning environment! This is awesome! This sounds like Capturing Kids Hearts. I’m wondering how she does her affirmations with that many kids. I teach 6th grade and have 61 students. I’m trying to figure out how to do my affirmations after coming from a 5th grade self-contained classroom. I started this affirmation wall with 90 students and learned how to make it more efficient through trial and error. I now have 150+ students and it takes me less than 15 minutes to deliver, and about 15 to read through them all first. The time is well spent. I am working on a guidelines post and will share ASAP; I’m super excited to think that together we can teach our students to look for what is good in the world, including each other and themselves. =) Coming soon! I love everything about this room and the rationale behind it. I hope to offer this level of comfort to my students! For this first time since I became a math specialist 10 years ago, I have a large classroom instead of a tiny nook filled with to much stuff. I have been working hard on the seating options this year and have 3 big windows that let in so much great light. Now that the days are getting shorter, I am finding myself having to turn on the large overhead lights which drive me crazy. I am going to visit my Grandfather this weekend and see if I can bum a few of his fun lamps off of him and bring more lighting options into my classroom. I’m so glad I have the windows; it helps so much. Good luck at your grandpa’s! Maybe if you share your passion, others will start offering you their throw-away-furniture and accessories! Thanks to a bunch of people like that, I have the room I have today. In any case, you got this! My dream is to get newer items in there too. I’m looking into grants to fund some of those cool desks that can be used to sit or stand – have you seen them? Hi, I would love to hear more about your affirmation wall and how you manage it for 150+ students. What is your address system? I am working on a guidelines post and will share ASAP; imagine the impact we could make if together we can teach our students to look for what is good in the world, including each other and themselves. =) Coming soon! I encourage your readers to find more inspiration at classroomcribs.com as well! Thanks for keeping design and students at the center of both our classroom activities and the physical space. I wish I could do something like this in my classroom. I’ve had curtains, beanbag chairs, and other “homey” things in my classroom taken out due to fire code. I also wish I could paint pictures and quotes on the wall, but we’re not guaranteed the same room year after year, since we may be switching grade levels every year. Looks like an inviting space, though! I like to learn from innovative and brilliant people like you. God bless! Thank you for your affirmation! Like Cult of Pedagogy says….Teacher Nerds: Unite! It’s good to be in community with you! I love this article! We have flexible seating and spaces in our room and the children really do gravitate to the spaces that work best for them. I also have table and floor lamps instead of the overhead lighting and the mood is so much more relaxed, yet the children are fully engaged. I’m glad you second that motion. I am so glad that you and I share a similar experience in that the students are engaged in a relaxed environment! What do you do during state testing? My principal is on board for our lower grades but is concerned about “testing.” Any suggestions?? I love the room and couches and comfy places. I am wondering how you deal with lice and bed bugs on the variety of surfaces you offer? I haven’t had to deal with that. I imagine that if I had to deal with that, I’d probably get rid of the couches or whatever, but still keep the philosophy? Flexible seating doesn’t HAVE to include plush things. I wash all the blankets, etc. at least once a week in our old home economics room. This “flexible classroom” is brilliant! I love it. I would have really thrived in a classroom like this. It’s comfortable, inviting, and inspiring! Thank you for sharing it…It has inspired me to do something about my work space. How kind! Thank you for your affirmation. I wish you all the best on your own work space. Keep us posted! Your room is absolutely gorgeous! I have flexible seating in my 5th grade classroom as well – chairs, hokki stools, bean bags, pillows, small stools, a futon, tables instead of desks. This is my first year without assigned seating. It was a huge mind shift and a bit difficult for me at first (apparently I like control more than I realized! ), but I absolutely love it now and I will never go back! My school is building a new campus that will open next year, and we will finally have windows in our classrooms! I can’t wait to use natural lighting and lamps like you have here. I also love your affirmation wall. I do that in 5th as well, but I’ve just been calling them “kindness notes.” I think I may switch over to your terminology! I have found myself revisiting this page several times during the past few weeks! I love the atmosphere so much. I’m fortunate to be at a school with a tremendous amount of flexibility and freedom to do whatever it is I want with my classroom. There are things I love about my classroom (I got to paint a wall yellow, and I was able to hang colorful curtains!) but there is definitely room for improvement. This year I got rid of my teacher desk, so I’ve been using student desks more often–and I’m learning that they are not very comfortable at all! I have a discarded coffee table and a comfy chair that might work to start me off– but I have a vision and a plan! I’m putting my teacher desk in an adjacent office this coming year. I will let you know how that goes! I want the whole classroom to be a good working space for all of us! =) Keep us posted on that “vision and … plan” okay? WOW! Just wow. This room takes my breath away. My students would love it. Unfortunately my classroom seems to be about half the size of yours and I have to be able to fit 30 students, and share occasionally with other more conservative/ traditional teachers but maybe some of the ideas are doable. I also avoid using the fluorescents in my classroom and the students are always grateful. I’m looking into starting this kind of classroom environment. How do you handle testing in this environment? I have read the post and all the comments and my brain is already going crazy with ideas!! I would love information on your creating different variations of a test and also does it take longer to grade that way? Thank you for sharing!! Amazing classroom, it looks like Starbucks! Thank you so much for sharing! I teach fifth grade and love your ideas! I am curious about how you handle state testing. Do you put desks back in? Thanks!! My administrators know not to use my room for state testing. I am usually sent to another room that is more traditional to proctor there. I do actually move my room around a lot, and so I can emphasize table space more readily, if I want to. Sometimes my room is used for alternate seating locations. I hope that helps! PS: If my room is used as alternate seating, they usually HAVE to use the overhead lights instead of the softer lighting. I teach third grade and testing has to take place in my room. Any suggestions for making this work? My principal is on board for flexible seating for lower grades….. but has concerns about state testing. I am trying to give her solutions….. but I am new to this type of seating. Just looking at these classrooms makes me want to teach in one. I just recently bought a carpet for my class and the kids love it. They can sit and read, work in groups or we meet as a whole class. Now I want comfortable chairs! I’m curious if you needed to “pitch” this idea to your administration or not. This would work so well in my classroom, and I already have a corner with 2 chairs & a rug. I HATED my overhead lights, and typically keep them off. Do you ever have any issues with students cheating during tests? I didn’t have to pitch it, but if you think your administrators would be happier knowing up front, that would be good. I guess I did ask them about their philosophy about teacher-empowerment in changing rooms. They only asked me to tell them if I was trying to implement permanent changes, like paint and structural change. As far as tests go, I actually make multiple versions of objective tests that look exactly alike and the kids know this. So it doesn’t help them to look at a neighbor’s test. It is very easy to do this using different pieces of technology available to anyone for free. If you want help figuring that out, let me know. I also teach English, so cheating on a writing test is more difficult than if I taught another subject area. Aloha from Hawaii! I love how your classroom is set-up so much that it’s inspired me to try it out in the larger classroom that I am moving into. I think the inviting atmosphere of the classroom will help me as much as the students. I do have a question about taking roll. How do you do it without a seating chart especially when you have a substitute? Hi there! I greet students at the door, so I usually remember when I’m taking roll and look around the room when I want to be sure (I try to take attendance as soon as I’m done greeting. Another thing that really works is having a student duo be in charge of attendance when you are gone; I ask for volunteers for this instead of assigning it. Kids love to take the responsibility. I have a few other ideas/tricks if those don’t work for you. Thanks for the suggestion. I’ve tried to greet students at the door for every class but unfortunately, it’s gotten extremely hectic for me and I’m barely ready myself as kids stream in. I’d love to read your other tricks. One more question – I have several students in every one of my classes that I am required to place in preferential seating areas. Since most classes are set up with student desks in rows, that means sitting in the front and near the teacher. In the past, I didn’t have enough seats to place them all in the front row and there isn’t enough of me for all of them to sit close to. Do you have any similar requirements for your students in your classes? What do you do? I’ve been making an effort to move around the class and stand near those students when giving instruction. I don’t know if that is acceptable enough in regards to following their plans (504/IEPs). To me, it keeps all students on their toes too and I can do the teacher presence strategy to address not so ideal behavior without calling them out when I’m giving instruction for all students. Sorry this is long. I was so inspired by your classroom and so I set up something similar with a lot of old stuff from home, Goodwill finds, and Craigslist finds. The kids LOVE it as well as the teachers. The atmosphere is a bit different – the kids do seem a little more relaxed and I’m working on training the kids to move to different spots. I’m still working on finding different chairs for the kids to sit down on. Thank you for being such an inspiration. I’m looking into that affirmation wall as well. So grateful to have found your classroom on the Cult of Pedagogy. Thank you! I love this! I am a 4th grade teacher and want to try this. My question is about testing. Do you simply put them at desks and tables for testing? I love the affirmation wall idea! My students last year were so negative toward each other and I’ve been trying to look for ideas to avoid that in the future. Do you think this could work in a middle school setting? What kind of expectations do you set for it? What happens if there’s a student who doesn’t recieve any affirmations? How does this type of classroom not break the rules of the health/fire inspector? We’re not allowed any furniture that doesn’t have a label on it that says it is fire retardant. And even with the label, it’s frowned upon. Just starting flexible seating with my middle school classes this week. Have similar rules, but definitely adding the one about choosing a different spot each day for the first week or so. I can definitely see some kids becoming territorial. Sure I love this room but looking at it is like showing a picture of a food buffet to the starving… very unfair. I have 22 students in a room so small I barely have room for a work table. Last year I had exercise balls for every student but was told I had to get rid of them because the students were not allowed to sit on them during testing. No way would a student be allowed to sit on a comfortable sofa. I hope you know how blessed you are to be allowed to create this environment. I’d like to know the grade you teach and whether or not you teach at a public school. I want to thank you for posting about flexible seating in the classroom. This inspired me to make some changes for my EL middle schoolers. It has been so successful. They have loved the change and freedom to choose their seat. Thanks again for sharing! Hi there! I am really interested in trying your affirmation wall with my middle school theatre class next year. These kids are so tough and mean to each other, I would really love to attempt to get them to be nicer to each other, as well as themselves. Any advice? I’m sorry to be the negative one here, but I’m so tired of seeing these classrooms. I’d had a perfectly normal classroom with (gasp!) desks the past 15 years and my students have hardly suffered. Teachers have enough pressure placed on them without the additional concerns of having to have a “pinterest perfect” classroom. Just gag. If you don’t have anything nice to say, don’t say anything at all. If this isn’t your style then don’t do it. That’s okay. We need all kinds. There are students who will appreciate your classroom space too. If there’s really nothing you can take from this space then so be it. I, for one, can’t do much of it. Per the fire marshal: all furniture and rugs in my building have to be have visible tags showing they are fire retardant. Nothing can be hung from the ceiling. No paper can be hung from the walls (all posters have to be on bulletin boards). We cannot paint our own walls. Our fire marshal or his staff do walk throughs 4 times per year so we can’t wait till he comes and then put it up and be done with it until the following year. That said, a lamp makes a HUGE difference softening the lighting and in making the ambience feel more homey. Now, all of this is, of course, my opinion and I choose to have a lamp and a few plants. But I also choose not to rain on your parade. I understand we all feel pressure but we can’t do it all. We have to choose where to put our energies. If someone wants to put their energy into the setup of their classroom how does that pressure you to do anything? If you want to open a dialogue about classroom atmosphere and seating and all that entails, I feel it has to be done with less hostility and sarcasm. I hope that you are having a better day today than this message seems to indicate you were having. I hope your year goes well and quickly but that your vacations are productive and seem to pass slowly. What a great classroom! As a parent of a child with special needs I can appreciate the work you have done to make your classroom a positive learning environment. Thank you for sharing! As an elementary teacher, I LOVE this! Your room looks great. Way to put kids first! I wish that our fire marshal wasn’t so strict with everything in our classroom needing to have a tag that shows that it has meets fire codes for public buildings. A lot of teachers at my school have had to remove a lot of their inviting furniture because of our lovely fire marshal. I am slowly transforming my 6th grade math class. I came across your blog, saw that first picture you posted, and I fell in love with that room!!!! My largest classes are 29 students (and I know some of you have many more students in larger bodies), so for me, space is the biggest issue (well, that and money:). Right now I have 4 tables that seat 5 each (the other end has 4 section drawers for math journal/working folder storage, and 2 sets of 4 desks. One student has to sit at the computer counter right now. I was able to move stuff around and clear out some space in the back. I’m planning on putting a futon, small coffee table and some Big Joe’s chairs, along with a rug there. Thank you for sharing all of these wonderful teachers’ rooms. I would love to see more. I’m looking for ideas on storage of student stuff (bags, lunches, water bottles, journals, etc.) that they don’t need for my class. I’m inspired to document my class room redo by taking pics. Thanks again!!! That sounds really exciting, Carol!! Keep going! Hi Kelly! This is Holly, a Customer Experience Manager for Cult of Pedagogy. Getting more details on classroom design and flexible seating, etc. is a common request, so I hope these posts will help! 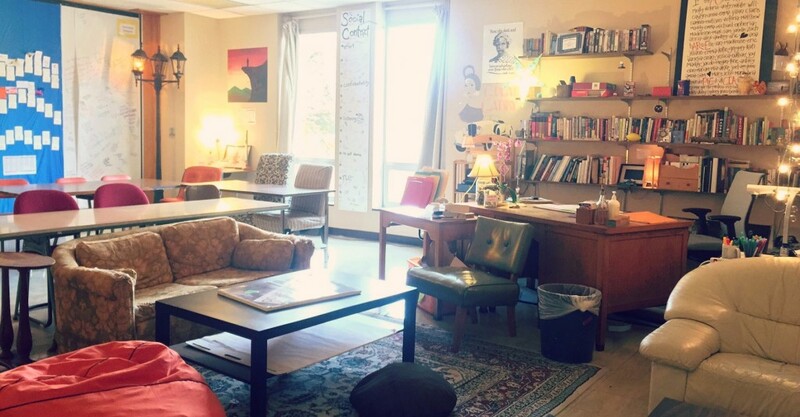 Definitely check out the latest on classroom design: 12 Ways to Upgrade Your Classroom Design. You can of course reach out to Rebecca, whose room is featured here, through Twitter, too. I love the look of this classroom! I am hoping to model my own after this next year. One of the teachers I work with received a grant that is allowing us to purchase some alternative seating options and I can’t wait to see how it works out. It looks very relaxed and low stress. I also appreciate that the teacher took the time to describe how she decides or handles where kids get to sit.